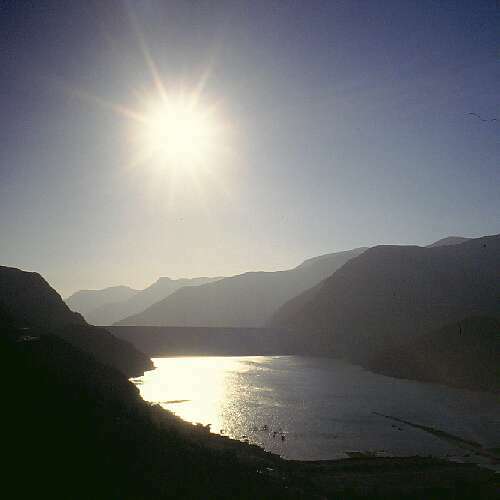 The Elqui is one of Chile's best known rivers. Not that it would carry very much water - it is located in a semidesertic zone and during most of the year it runs pretty low. 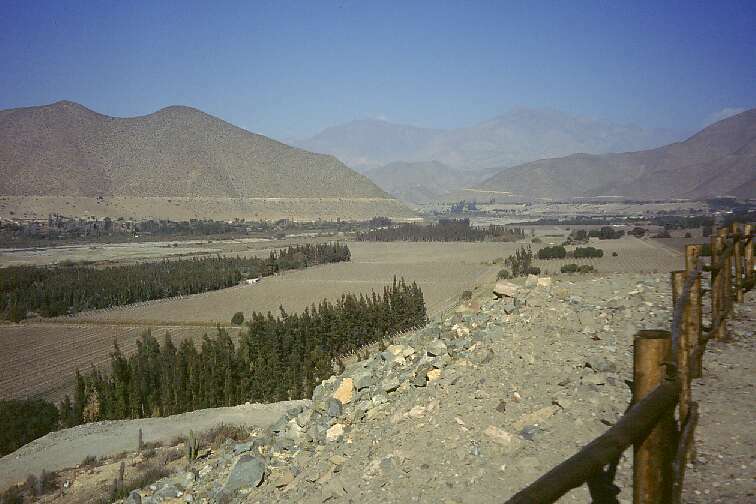 Nevertheless, it irrigates a large valley, famous for its grapes and some other produce, which grow particularly well because of the very high number of sunny days. 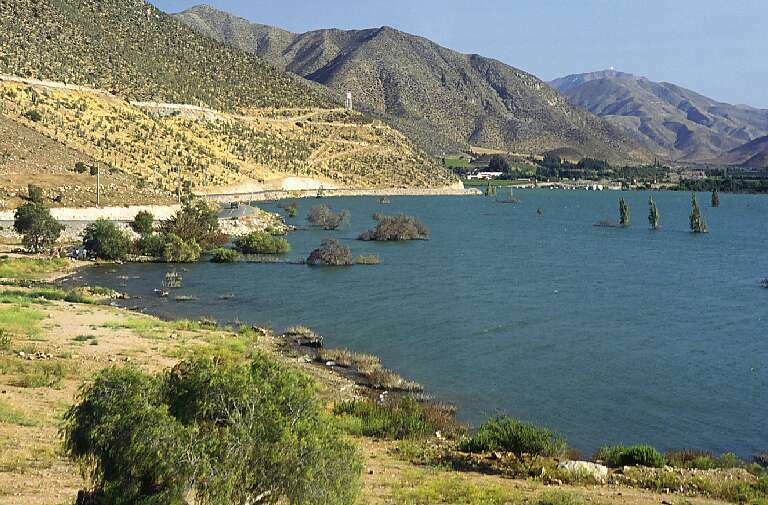 But when one of the rare bad weather episodes happen, the Elqui river can turn overnight into a roaring monster! During the winter of 1997 we had such a rainstorm. The river swelled and caused extensive damage. This bridge normally is used by several large trains a day, which bring iron ore from the Romeral mine to the Guayacán port. 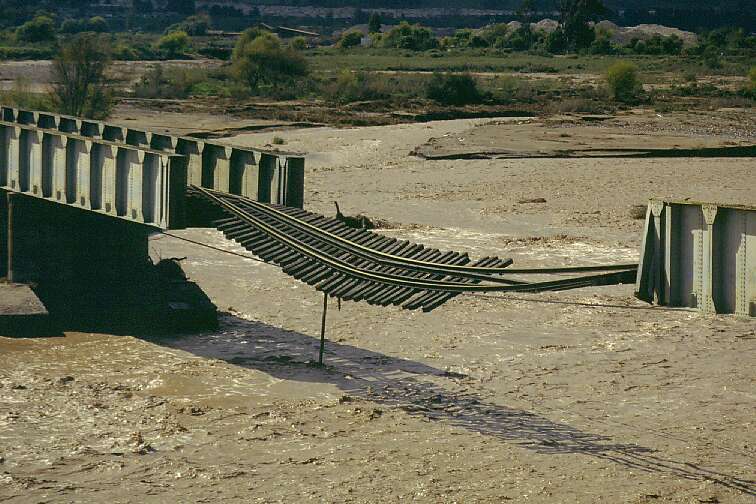 Romeral had a pretty hard time minimizing impact on operations while an emergency repair was applied to the bridge. The river also flooded many areas, took away roads, and even ate some heavy machinery that was being used to keep it at bay. 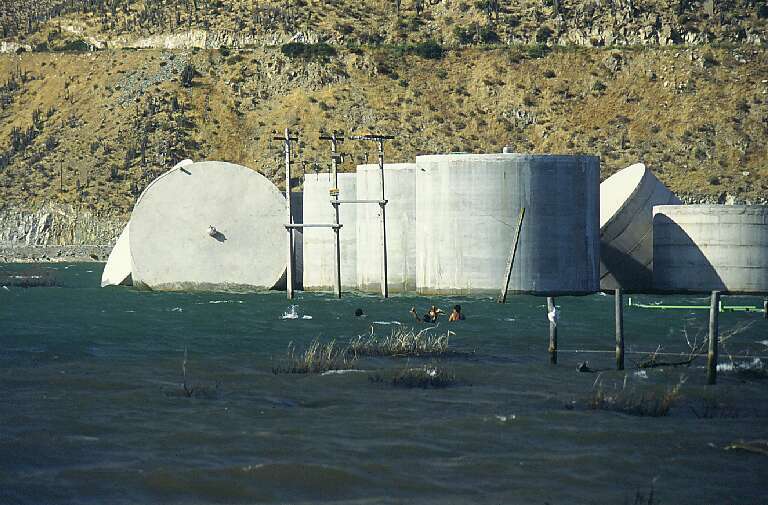 All this damage refreshed an old idea: To build a dam that would avoid such floods, while storing water for irrigation during the frequent dry years. 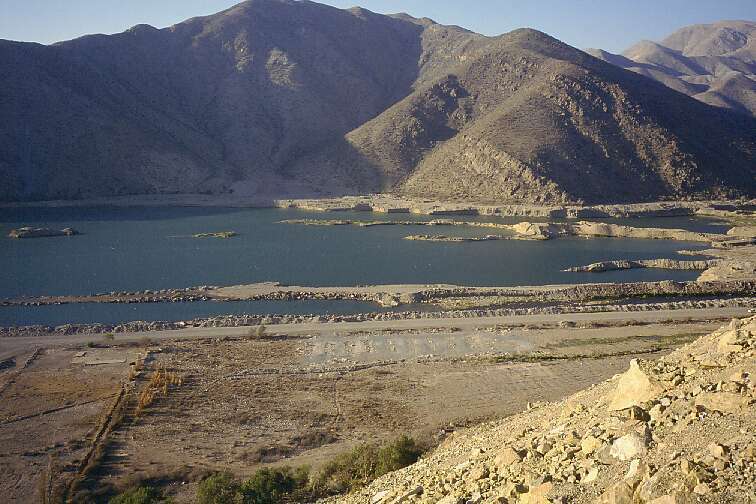 This is the area that was chosen for the Puclaro dam. 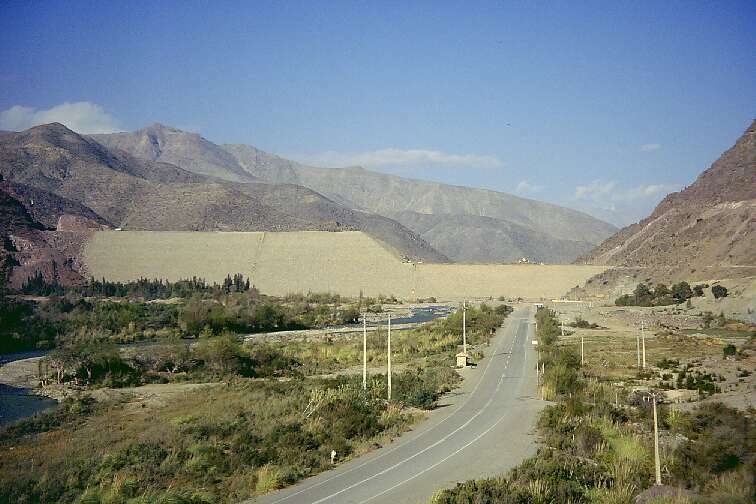 The valley has a narrow section here, so that it was feasible to build the dam. The land that would be inundated was mostly being used for growing grapes; people were resettled and got paid for their land. The major problem were two towns that would end up under the water. 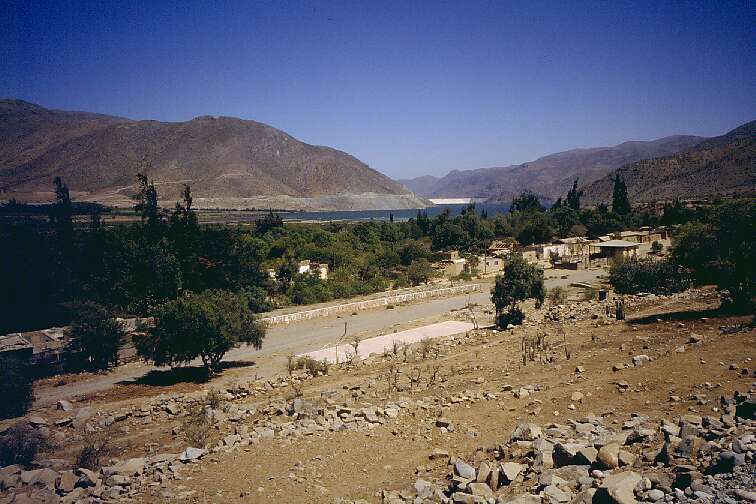 The dam builders agreed to rebuild these towns at what would become the shoreline of the new lake. It's 1999. Construction is well under way! The highway that ran along the valley had to be closed, and a new one was built to replace it. 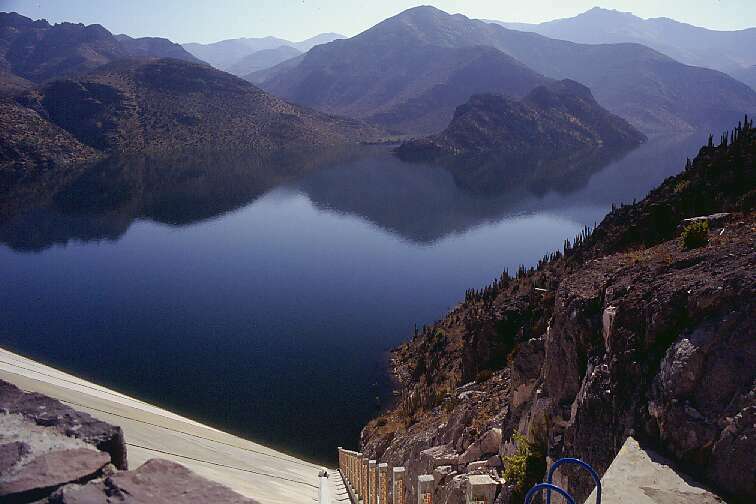 It runs above the future water line along the right-hand mountains, and crosses the area of the dam via a tunnel through the solid rock. The dam was built by heaping up and compacting gravel, and adding a concrete layer to make it watertight. 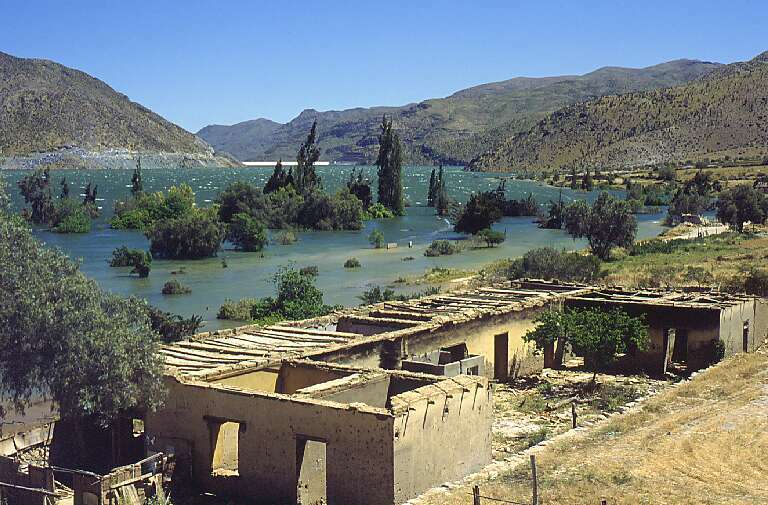 This kind of construction has the advantage of being highly resistant to earthquakes, which is a very important point in Chile! 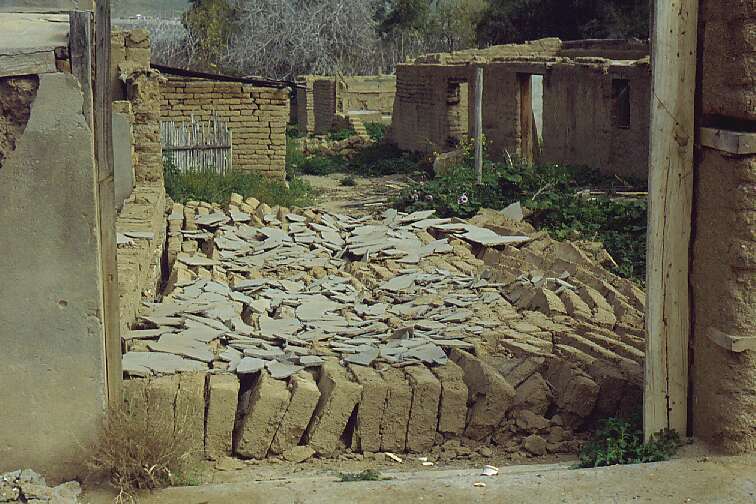 After all, the world's strongest earthquake ever registered happened here. Behind the dam. Most of the action happened on this side. 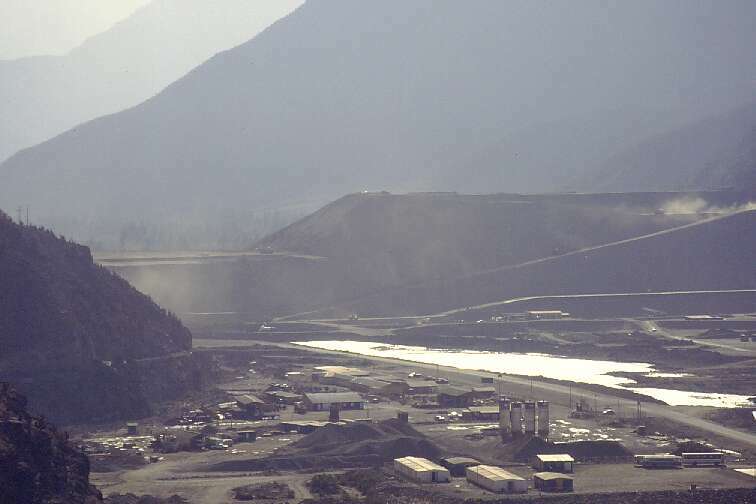 Large mining trucks were used to move the enormous quantities of material needed for this project. The building company set up a camp here. Early 2000. The last year of the 20th century brought the completition of the dam. Even before the last touches were finished, the gates were closed, and slowly some water started accumulating. It had been a dry time, and the river was just trickling along. Downriver of the dam, it was almost dried out. Only a thin sample of water was left to reach the ocean, so the riverbed would not dry out completely. Soon later, it started looking like a lake! 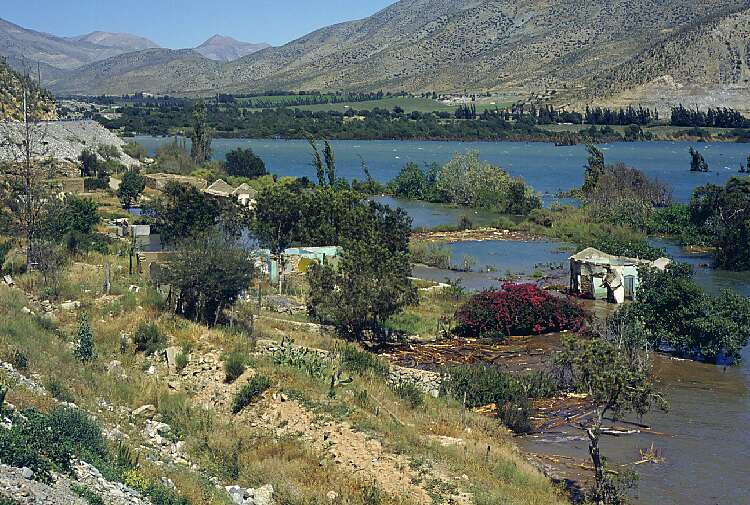 The water had covered the former construction camp, and was slowly advancing over the vineyards, drowning many hectares of Pisco country. February 2002. A rainy 2001 winter had done a great job in accumulating a good quantity of water, and the high summer temperatures in february were melting the snow accumulated in the high mountains. The river was coming down full to the brim, and one could almost watch the lake's water level rise! 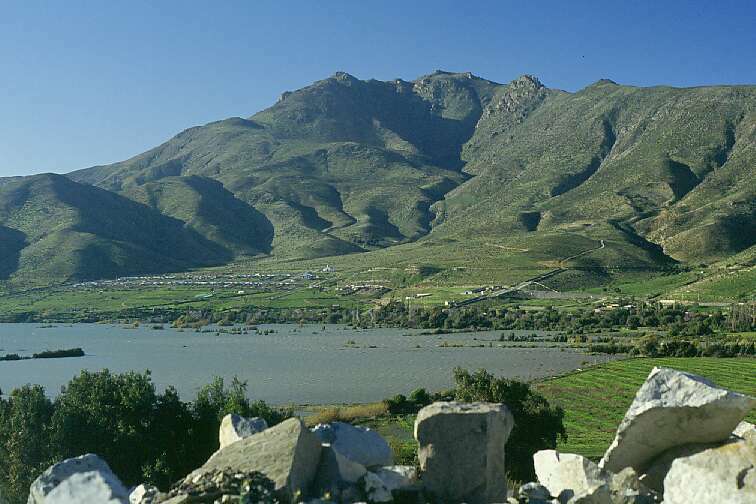 The vineyards are history, and an almost idyllic lake has replaced them, even including an island! At the temporary end of the lake, where the former highway emerges from the water. I visited this area very frequently, to record the rise of the water. Sometimes my sister came with me, adding her particular touch of color to the scenery. It's time to introduce Gualliguaica. It was a typical roadside town, naturally developed during centuries. 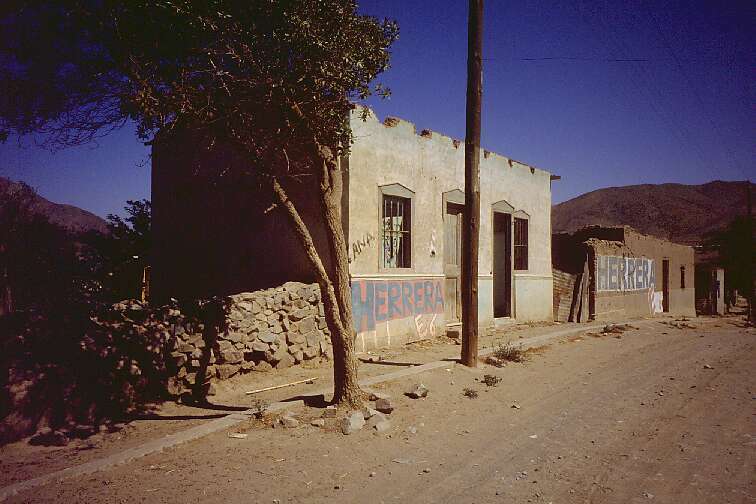 Almost all construction was of adobe, which is inexpensive and provides very comfortable housing in this climate of strong day-night temperature changes. 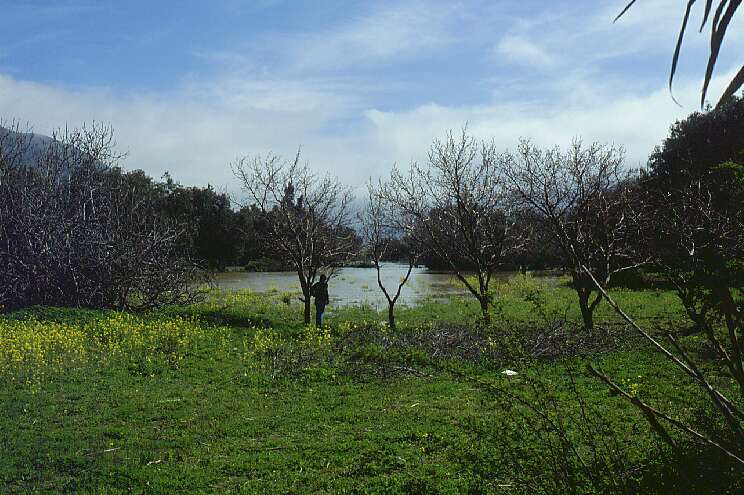 The houses had gardens full of fruit trees. 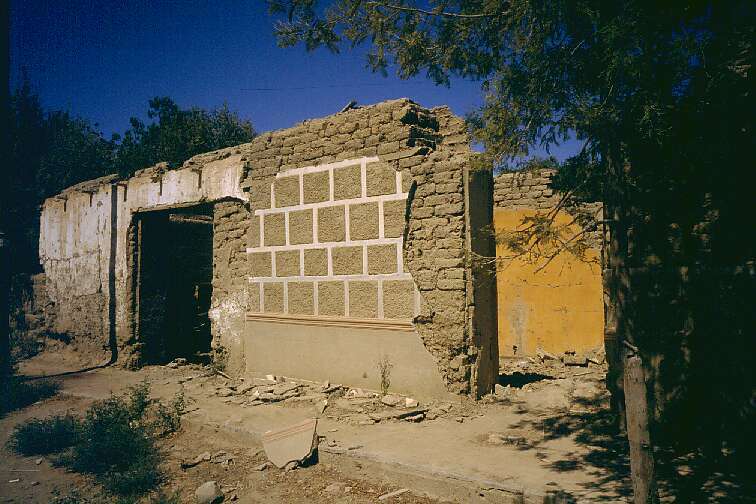 But now, the town had been abandoned almost completely. The water was coming, meter after meter, to implacably take possession. This was a stretch of the main street. Most houses have been dismantled to the widest extend possible. 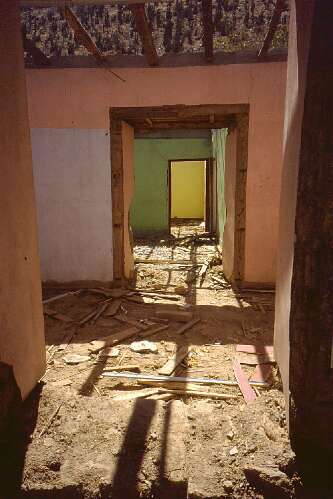 People removed the roofing, wooden floors, and at last the doors and windows. The house shown here is reaching that stage. Meanwhile, some people stayed in the town until the last moment, trying to dilate the inevitable. 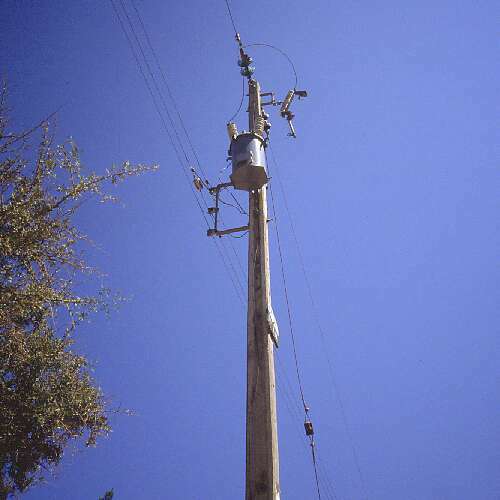 A pole transformer, its input switch open, symbolizes the shutdown of the town. The disconnection of electrical power was one of the very clear signals that it was time for everyone to leave for good and take up residence in the new town, built further up the hill, outside the reach of the water. This house was inhabited longer than most. But now its time has come too, and workers are removing pieces of wood and other re-usable material. 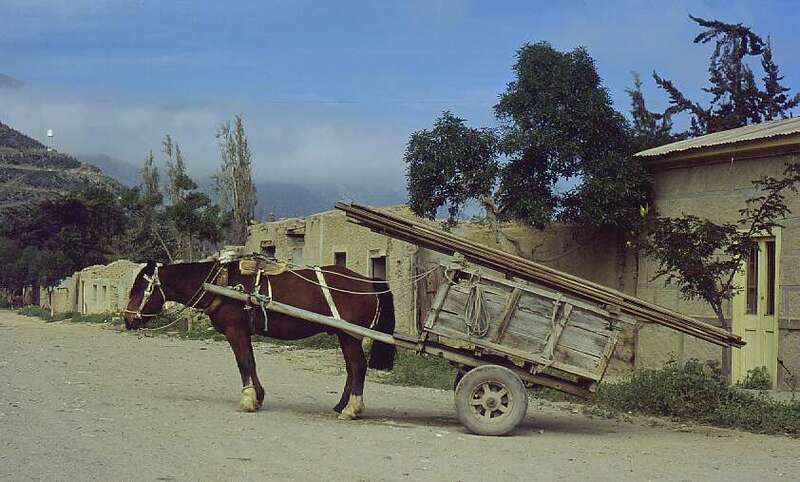 A one-horsepower truck equipped with four-hoof drive is used for transport. If you look closely, you will even discover the applied parking brake! This house has completed its recycling procedure. Only the bare walls remain. And the trees in the garden. When the water invasion was imminent, some people came back and cut down their trees. Certainly a living tree is better than a cut one, but a cut tree whose timber is put to good purpose is still better than a tree drowned under the water. It is a hard thing to give up one's house, garden, and with it the entire environment where one has lived since birth. And for most people in the town, this was the exact situation. Inside one house. Even the door frames have been removed. A few wooden pieces remain in place - probably rendered useless by termite attack. Through the missing roof, you can see the mountain behind the house, scattered with cactus. 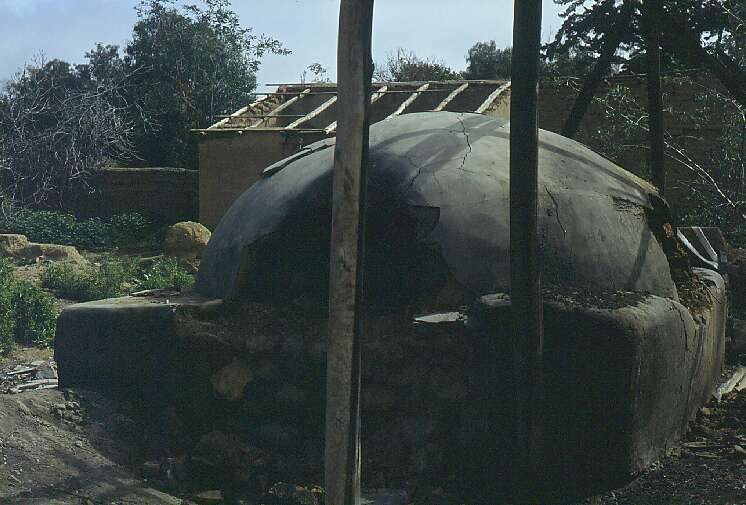 This was the furnace in the town's bakery. The winter of 2002 brought a good amount of rain again. In august, grass was growing everywhere between the ruins of Gualliguaica. 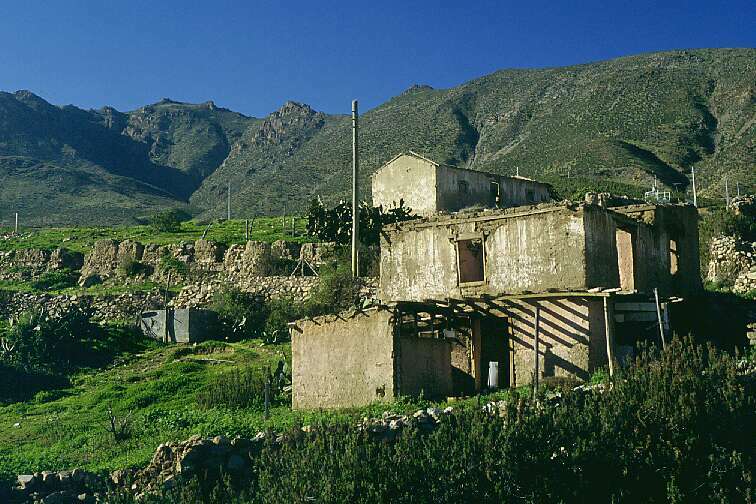 These houses, located higher on the hill, were abandoned later than the rest of the town. But they too were bound to be finally drowned. 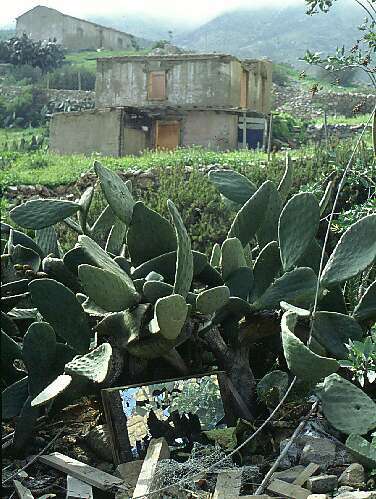 A shattered mirror resting between fruit cactus still does his best efforts reflecting an image of the town. But the rain of the winter has also brought down many walls. Adobe construction must absolutely be kept dry. Then it can last for centuries. But after the roofs were removed from the houses, it only took some rain to soften the walls and make them topple over. This is a particularly nice view of a wall that fell over and shattered on the ground! The water level is rising fast! The straight line acting as limit between the water and the green field was a low wall along an irrigation ditch. The next day it was gone under the water. The old town is at the far right of the photo; the rows of houses up the hill on the left side are the new town. I talked to some of the people there. They are of course sad for the loss of their old town, but they understand the necessity of it, and are firmly decided to make the new town at least as good as the old one was. Of course, the freshly planted trees will take many years to reach the size and beauty of the old ones, but eventually it will happen. The water is invading the gardens! Some people came back every day during this time. There goes the plum tree swimming... there the fig tree.... the bougainvillea... and so on. 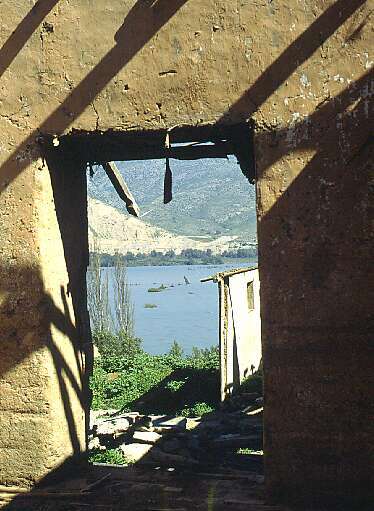 Through a doorway of an abandoned house, the lake can bee seen invading the town's periphery. The next time I came to Gualliguaica, I could no longer drive into the town. The water had taken possession of the street! Most buildings disintegrated as soon as the water reached them. One house, built of more waterproof material, remains standing, but certainly not for long. 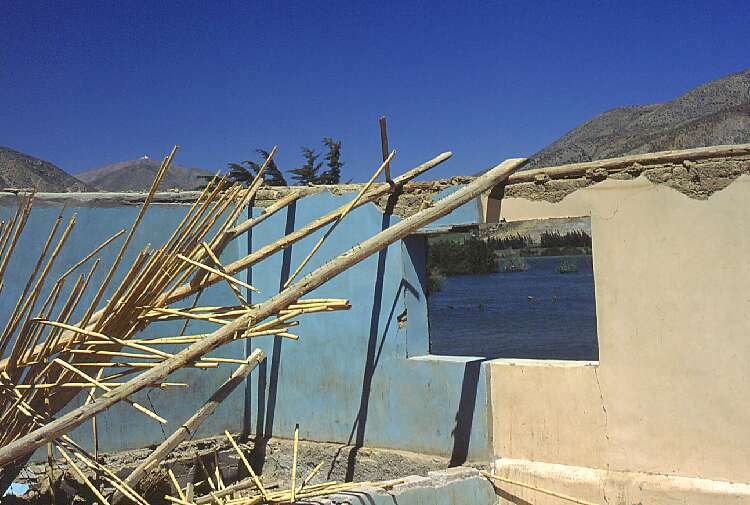 A lone front wall, built from Adobe like all others but sheathed in cement mortar, has survived several days in the water. 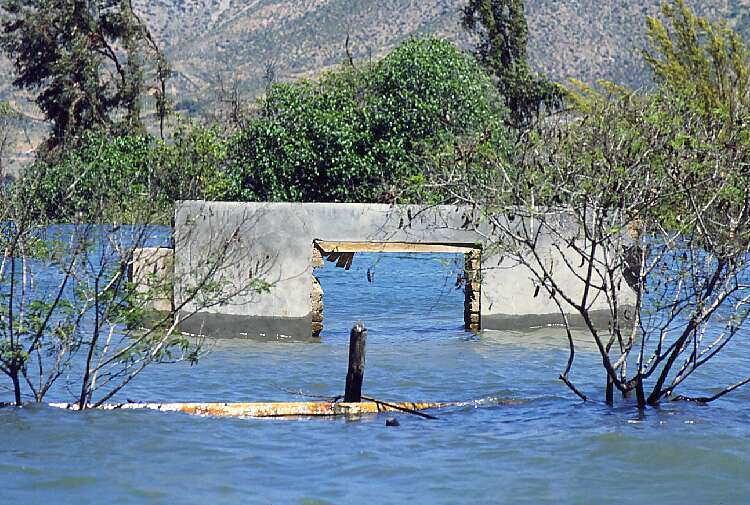 The rest of the house behind it is already gone, dissolved by Puclaro Lake's water. So I retreat to higher grounds, trying to get my last photos of old Gualliguaica. This house once had a view over all the town, and the green valley. Now it has a view over the blue lake. But very soon, it will have no view at all. It will cease to exist. The entire main street is gone. Muddy colors show where adobe houses have dissolved. The trees, probably wondering about the sudden abundance of water, are showing their last green, suddenly free of shading walls. January 2003. The summer heat has been melting the winter's snow in the mountains, filling the new lake to the brim. This is as high as the water can get. Nothing of the old town remains, only the tips of the tallest trees still look out of the water. 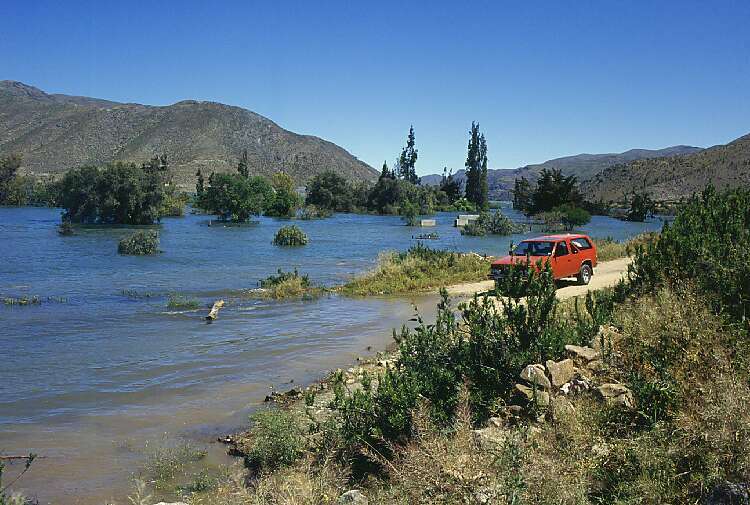 The road is just a few meters above the water. Old Gualliguaica is no more. Back at the wall, a girl looks in awe at the masses of water flowing out of the lake. This is the overflow gate, where excess water is dumped. Snow melting was in full progress, so there was a lot of water to be dumped. 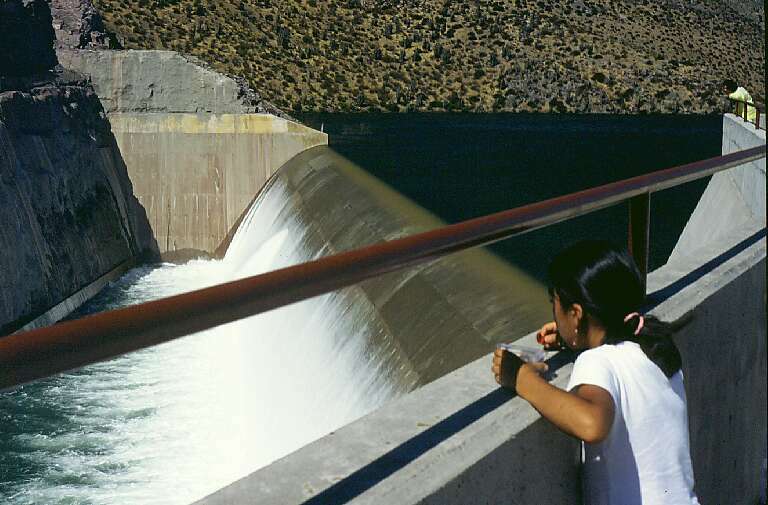 The dam has become quite a tourist attraction. It is open to the public almost all day long. 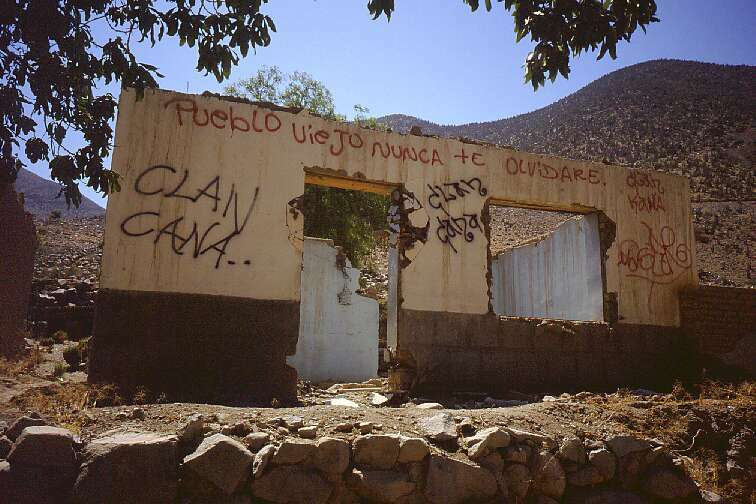 Ending the story about Gualliguaica, I would like to translate the graffiti on this wall, no longer in existence. It reads: Old town, I will never forget you. This series was photographed on Fuji Sensia and Provia 100F, using a Chinon CE-4 camera with a Cosina 28mm f/2.8, a Pentax SMC-M 50mm f/2, a Pentax SMC-M 135mm f/2.8, and a Vivitar 75-205mm f/3.8 lenses, while a few of the pictures were made with a Ricoh GR-1s pocket camera. The slides were digitized using a Microtek Scanmaker 35T+ film scanner. Back to Stories in photos.